Being a Sindhi I have a strong affinity to some Sindhi delicacies. Sindhi kadhi, tomato kadhi, fried potato-capsicum, potato-okra, seal phulko, and the quintessential Sindhi Papad are the things I can never say no to. Sindhi kadhi is prepared at least once a week in our home. It’s our go-to recipe when we want to have something soupy, tangy and spicy. We like the kadhi spicy, so this recipe calls for a lot of red chili powder. Also whole green chilies are great to bite on. But you can adjust the quantity of chilies as per your taste. You can add veggies like carrots and French beans if you like. I have added cauliflower, potato, okra, drumsticks and cluster beans. Try to choose the cluster beans and okra that are small and tender, so that will get cooked easily. 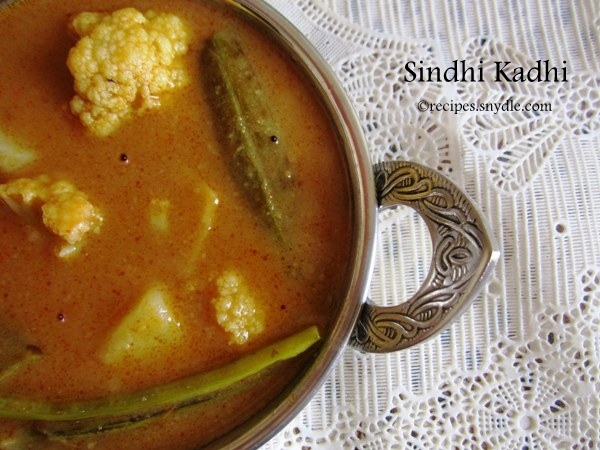 The traditional recipe of Sindhi kadhi calls for hing / asafetida. If you like its flavor, you can add 1/4 tsp of it to this recipe when you add curry leaves. I gave it a pass though. 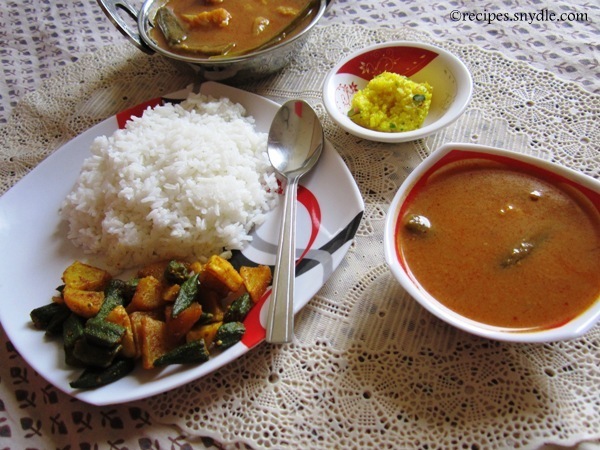 You can have this comforting kadhi with plain rice. Just take some rice on a big bowl and pour a lot of kadhi over it. Enjoy the soupy delight hot. Last week we had some relatives over. So we served it with fried rice, fried potato-okra, papad and some pineapple fudge. Needless to say, they enjoyed the lip-smacking meal right till the last crumb. This recipe serves four. For the purpose of measurement, 1 cup = 250 ml. 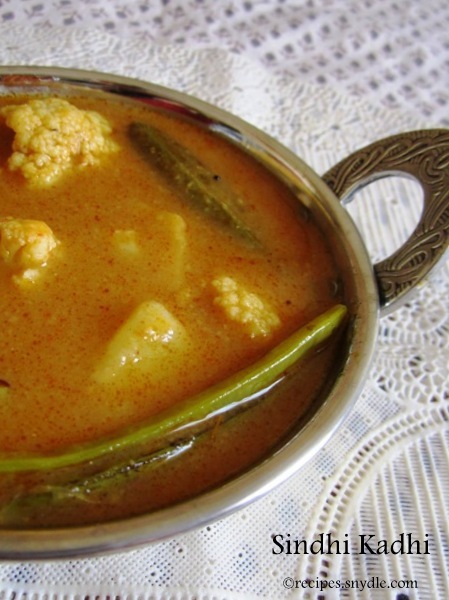 Now let us take a look at the recipe of Sindhi kadhi. Wash the okra and pat it dry. Cut it into two by splitting it lengthwise. Heat 1 tbsp oil in a pan and toss in the okra. Fry the okra on medium heat till it turns golden brown and partially tender. It will shrink a bit. Turn off the flame and remove the okra on a plate lined with kitchen towel to drain the excess oil. Frying the okra ensures that it doesn’t make the kadhi mushy. Heat 5 tbsp oil in a heavy bottom deep pan, degchi or kadhai. Add in the mustard seeds, cumin seeds and fenugreek seeds and allow them to crackle. Toss in the curry leaves and mix. After a few seconds, add in the gram flour and mix well. Roast the gram flour for about 2-3 minutes, stirring it occasionally. Adjust the heat between medium and low, whenever needed. Add in the finely crushed ginger and cook for 3 more minutes. The gram flour and oil paste will turn into a golden and aromatic mixture. It’s time to add in the grated tomatoes and allow them to simmer for a couple of minutes, till the raw smell disappears and oil begins to separate. Add in 1 cup of water little by little and mix well. Make sure there are no lumps formed. Add in another cup of water little by little. When the gram flour looks like a thin paste, add in the remaining 3 cups of water. Add salt to taste. Add in the turmeric and red chili powder and bring the kadhi to boil. Toss in the drumstick, potato cubes, cluster beans and cauliflower florets. Cover the kadhi pot with the lid and turn the flame to low. Allow the kadhi to simmer away for 10 minutes. Add in the tamarind pulp, fried okra, whole green chilies and chunks of tomatoes and put the lid back on. Simmer the kadhi for another 10 minutes till the veggies are done. They should be well-cooked yet crunchy and not mushed up. The potato and cauliflower should hold their shape. The kadhi should be tangy, sour and spicy. The consistency should be soupy. Moreover, you can adjust the amount of chilies and tamarind to get the desired hotness and tang. If you want a bright red color, give a tadka using a spoonful of oil and some more red chili powder. I do that for some extra zest and color. Sindhi kadhi is ready to be served. Serve it piping hot with plain rice.